Remuna Singing Bowls have a simple and rather refined profile that gently curves away from a medium-size flat base before gracefully curving back towards the rim. The widest part of their moderately bulbous belly is typically just below the midpoint. They have thin smooth walls and a plain or single-grooved lip. Decorative markings, if any, are limited to a few concentric circles in the centre of the bowl, and perhaps an incised line below the outer rim and around the belly. Some bowls have a small raised area, or mound, in the centre of the basin, otherwise there is little variation in form apart from size. Remuna bowls are often found in a good state of preservation. Some carry a small inscription. 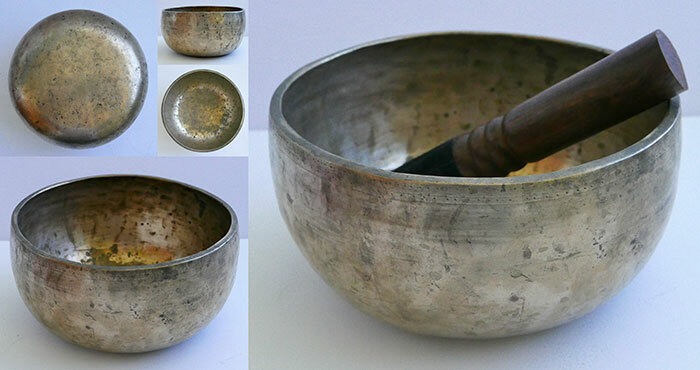 Click here for more information about antique Remuna Singing Bowls. Please click the BOWLS tab in the above Toolbar to view by Note, Chakra, Size, Attribute and Price.